It was 5:45am, and Will Parrish sat on a thin platform 30 feet above the ground. He was exhausted. His plywood perch rested partway up a piece of drilling equipment called a stitcher, which looks like a narrow cell phone tower jutting a hundred feet into the sky. He'd wanted to climb higher—here, just above the Bobcat arm steadying the metal column, a cherry picker full of armed police could easily bring him down. But climbing even the stitcher's base had been grueling enough to make him vomit, mostly because of what the longhaired Ukiah resident carried. Along with his platform, he'd shouldered a bucket, three gallons of water, a sleeping bag, a tarp, granola bars, an apple and a can of lentil soup. He planned to stay as long as he could. Parrish, a reporter for Mendocino's Anderson Valley Advertiser, was occupying the stitcher to protest a $300 million extension of Highway 101 known as the Willits Bypass. By the time he decided to climb a vertical drill in June of 2013, he'd had been covering Caltrans' proposed diversion through Little Lake's wetland for months, his detailed, investigative prose growing harsher and more cynical with every new piece he wrote. He'd narrated the ecological devastation it would cause—filling a wetland, clear-cutting pine groves and drying a seasonal lake. He'd mapped out the politicians involved, traced their funding, found their regulators and uncovered multiple permit violations. He'd supported a two-month tree sit and watched as 25 squad cars full of armed riot police rolled into the valley to bring three activists down. 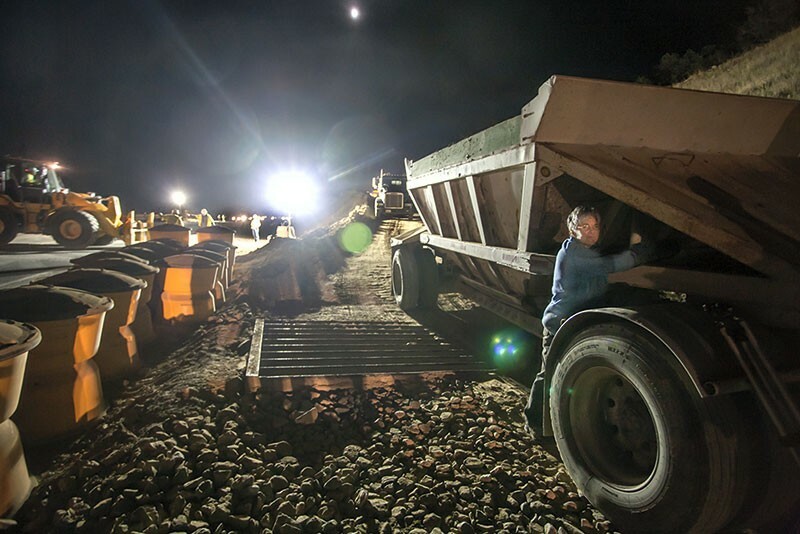 By June, bulldozers had arrived, pines were felled, and part of a hill had been scraped away. And Parrish rarely called the state agency by its name in his weekly installments, referring to it more often as Big Orange—each word bitterly capitalized to imply power that couldn't be checked. So against a growing background of high-profile journalists who have done the same, Parrish decided to become part of the story he was covering. His resolution to break into a construction site and occupy a stitcher—like Bill McKibben trespassing at Chevron or Glenn Greenwald helping Edward Snowden escape—blurs the ethics of a profession where impartiality has long been the sanctified norm. And it throws what happened eight days later—when Parrish was arrested, charged with 16 misdemeanors and slapped with a maximum of eight years in jail—into two conflicting narratives. On the one hand, he crossed the sand-line from journalist to activist, knowingly trespassed and expected to be charged. On the other, he'd written about enough lawsuits, conflicting statistics and regulatory breaches to fill a book; he'd begun to feel that mounting a stitcher was the only option left. Like Greenwald and McKibben, he'd started to see direct action as the logical extension of his role. NIGHT WATCH Peggy Backup, from Redwood Valley, locked herself to a hauling trailer last month. It was mid-summer, so even at this early hour, the sun hung over the hills. A dense white mist was thinning in the morning brightness, and Parrish could see the arid dirt patch that surrounded him. It looked like the surface of the moon. Months before, it had been a wetland where fissure-thin creeks cut through marshy reeds. Those waterways had been the source of the valley's name, Little Lake, because every winter they would flood and pool together in silver sheets that reflected the sky. Now, thanks to the tower where Parrish sat, Little Lake would be just a name. Though resting at the moment, the giant blue column was drilling wick drains deep into the ground, where the synthetic channels pulled water from 80 feet of silt. Acres of them had already been installed, and their white tips poked out of the dug-up wetlands in neat rows, folded over black runners so they looked like hundreds of stitched-up wounds. Thirty feet up, Parrish waited to see if he'd be taken down. 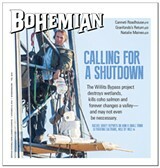 The Willits Bypass is a response to the bottleneck that occurs on 101 at the town's southern end. Local cars and semis carting loads up the coast stall in a long, smoggy line at the town entrance, where 101 has historically passed under a welcome sign that glows neon green at night. From there, the freeway becomes Willits' main street, complete with intersections and crosswalks. The snarl is a problem, a fact that few dispute. It's dangerous, and because the highway becomes a surface street lined with restaurants and stores, it can't be widened. Activists generally say they don't oppose an alternate route—just the six-mile, $300 million, four-lane one that Caltrans chose. So far, opponents to the project have filed two lawsuits and engaged in multiple direct actions that have resulted in dozens of arrests. Labeling their motivation with the blanket term "environmental" doesn't go far enough. Certainly ecological concern has been part of it; as Parrish wrote in an AVA article in January titled "The Insanity of the Willits Bypass," the freeway's construction will decimate—or, at the very least, displace—a litany of species. It will devour not only wetlands, he writes, "but oak forests, meadows, native plants, native bunchgrasses, Ponderosa pines groves, Oregon ash groves, habitat for northern spotted owls, habitat for coho salmon, habitat for steelhead trout, habitat for tidewater goby, habitat for Western pond turtles, habitat for peregrine falcons, habitat for yellow warblers, habitat for Point Arena mountain beavers, habitat for red tree voles, habitat for California red-legged frogs, habitat for foothill yellow-legged frogs, habitat for Western snowy plovers, habitat for pale big-eared bats and prime farmland." 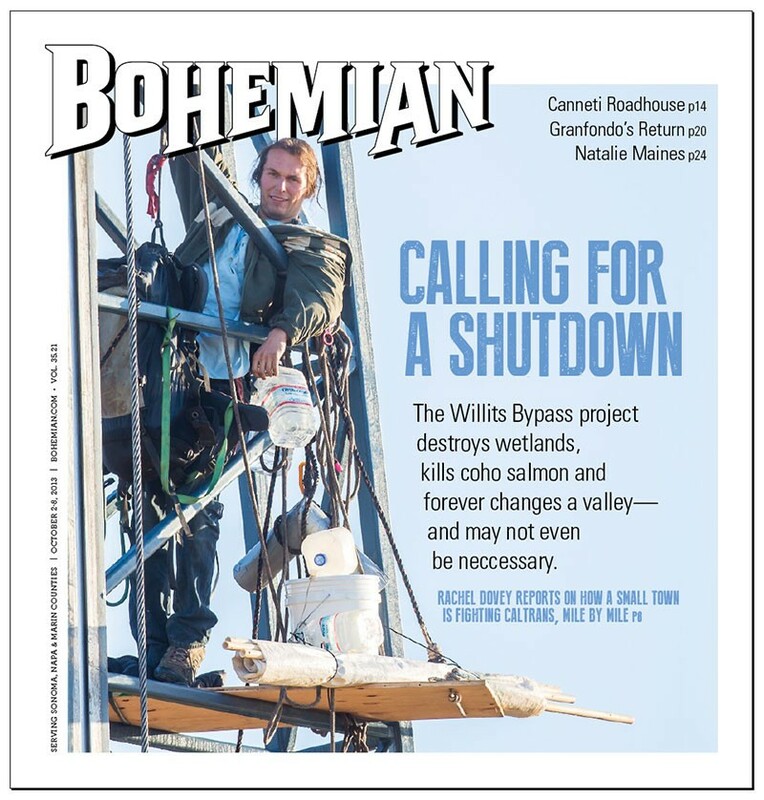 Most troubling in a region where dwindling coho are sacred, the project's environmental impact report states that the booms and blasts of pile driving could cause the threatened species' organs to hemorrhage and explode.